Download RedSn0w via this link : download redsnow, and place it in a folder that RedSn0w. 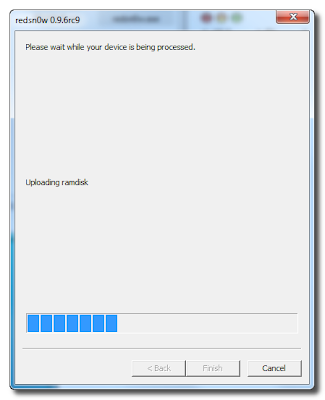 Download the latest firmware also 4.3.1 via the link below and place it in the same folder. 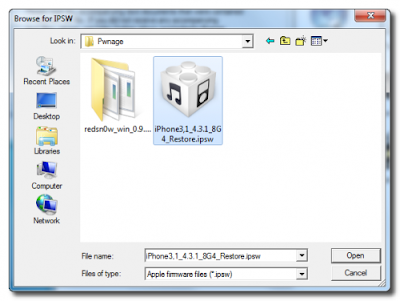 4.3.1 (GSM 4): iPhone3, 1 _ 4.3.1 _8G4_Restore ipsw. 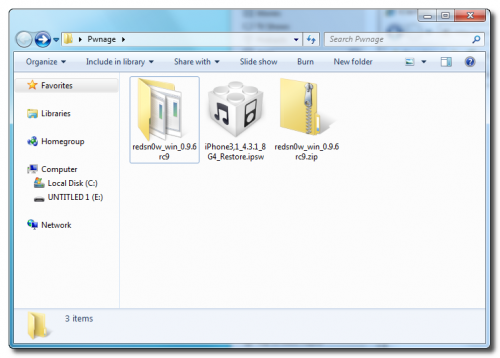 Extract the RedSn0w file that's already in the download above and place it inside the folder as shown below. Connect your iPhone to your computer and Run iTunes. After you click Restore, navigate to the Pwnage folder where desktop earlier on save. Select the downloaded ipsw 4.3.1 earlier on in that folder. Click the ' choose ' button for had passed. After iTunes is finished, Restore your iPhone (unplug your iPhone from PC) now open the folder Pwnage on your desktop and application should be the downloaded Redsn0w exe and extract earlier. After RedSn0w should be, click the Browse button. After you click Browse above, now select the ipsw firmware file inside the folder 4.3.1 Pwnage on your desktop. After the ipsw 4.3.1 last finished in the verify, click Next for the next step. RedSn0w will now begin providing data to Jailbreak your iPhone. Through this window you can choose the settings you want. If you are not sure, just make sure click and tick "Install Cydia" and click the Next button. Now your iPhone again cucuk sila, and OFF your iPhone after the dicucuk. Click Next. RedSn0w will now be teaching you how to make your iPhone is in DFU Mode. Press the power button on the top of your iPhone for 2 times. Without releasing the power button, now press the home button also for 10saat. After 10 times, release the power button. Continue holding the home button until your iPhone detect RedSn0w. your iPhone will now reboot by itself. Wait and don't click anything. RedSn0w will Jailbreak works commence. Just wait and see. Once completed, the RedSn0w will tell you. Just click Finish. Now your iPhone will reboot again and takes approximately 5 minutes to on again. Don't click anything. Just wait until your iPhone ON again.